Dr. William Clark: Dr. Clark was director of bands at New Mexico State University (NMSU) from 1985 to 1994 and then headed the NMSU Music Department where he is credited with doubling the number of music majors to more than 200 during his 11 years. Clark founded the Mesilla Valley Concert Band in 1986 and has served as conductor and music director for the past 30 years, during which some 220 free concerts have been presented by the 100-piece professional adult concert band for about 150,000 residents of central and southern New Mexico. In 1990, Clark founded the Las Cruces All-City Middle School Honor Band, which is selected by audition and presents a concert each year in February. In 1994, Clark founded the Las Cruces New Horizons program for seniors who desire to resume or begin playing instruments or singing after retirement. Clark's honors include: Las Cruces Citizen of the Year in 1988 and New Mexico Music Educator of the Year in 1992. He was inducted into the New Mexico Music Educator's Hall of Fame in 2007 and elected to the American Bandmaster's Association—the highest honor for international professional bandmasters—in 1993. 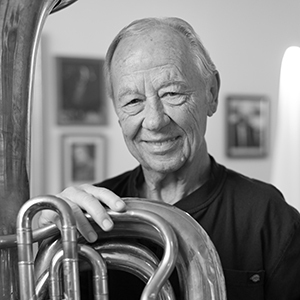 Clark maintains an active private studio and is a freelance tuba player. Catalina Delgado-Trunk: Artist Catalina Delgado-Trunk of Albuquerque has pushed the boundaries of traditional papel picado (cut paper) to a high art form. Much of her work is composed of complex panels that narrate Nahua mythology and explore contemporary themes. The roots of Mexican paper cutting reach back into pre-Hispanic times when obsidian knives were used to cut figures out of bark paper. In its modern form, tissue paper is used to form flags, typically displayed on a string, for decorating Day of the Dead altars. Delgado-Trunk is credited with transforming the art into larger works with more intricate designs and broad subject matter, with each piece telling a complete story. "As an immigrant living between two worlds, my language of art serves me well to bring down walls of misunderstanding as well as to build bridges of communication and comprehension between cultures," Delgado-Trunk said. "It is a metaphor for life because it is both fleeting and traditional." Born in Mexico City in 1945, Delgado-Trunk grew up in the Coyoacán district with Diego Rivera and Frida Kahlo as neighbors and family friends. 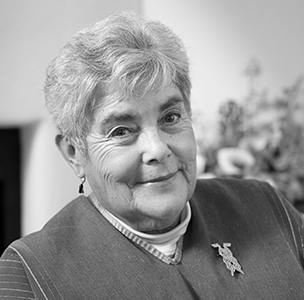 Delgado-Trunk and her family relocated to New Mexico in 2000, where she has worked closely with the National Hispanic Cultural Center and the Museum of International Folk Art, giving workshops and talks. She has worked with the Teachers of English as a Second Language Association using Day of the Dead as a teaching tool. She collaborated with the Museum of International Folk Art's Gallery of Conscience, Youth Media Project and ¡Youthworks! on a project in which Santa Fe area youth created audio pieces on themes of immigration and belonging. Delgado-Trunk has been the subject of a ¡COLORES! TV show on New Mexico PBS. Her art has been featured at the Smithsonian's National Museum of the American Indian and at the Museum of Contemporary Art in Kanazawa, Japan. She was one of the artists selected in 2014 to represent New Mexico at the Crystal Bridges Museum's "State of the Art: Discovering American Art Now." Vincent N. Figliola: Vincent N. Figliola, 79, has dedicated his life and art to expressing the dignity of the human struggle and the narrative of the land and its people. Figliola and his wife, Barbara moved to Las Cruces from Manhattan nearly 30 years ago, leaving behind the world of advertising where he was an award-winning creative art director. On Figliola's 50th birthday, after driving cross-country, he chose to settle in New Mexico's desert and mountain landscapes to "see if I could become a serious painter." Gary Biel of Las Cruces said he once asked Figliola why New Mexico. "He looked out his sunroom and pointed to the rock spires of the Organ Mountains and said, 'Look',” Biel noted. John O'Hern, Arnot Museum curator and current New Mexico editor for "American Art Collector" of Santa Fe, has called Figliola one of the "important realistic painters of this century." Whether exploring a complicated social issue with his "Border Paintings" or a seasoned man with the lilt of his cello in New Mexico snow, Figliola paints truthfully for humanity. 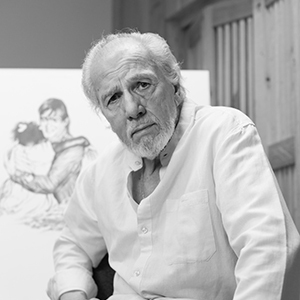 His oil paintings "Cruz and Jose" and "Moving On" were selected for the Juried International Exhibition: "III Bienal Ciudad Juarez-El Paso Biennial 2013: A Cultural Crossroads for the United States and Mexico," which was exhibited at the El Paso Museum of Art and the Ciudad Juarez Museum of Art. 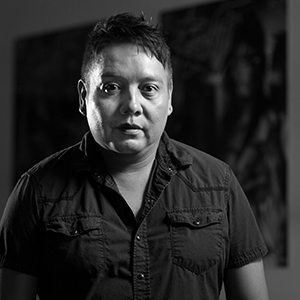 Virgil Ortiz: Hailing from a family of celebrated Cochiti Pueblo artists, Virgil Ortiz says it never crossed his mind to be anything other than an artist. "Art is in my blood," said Ortiz, 46, the youngest of six children, who grew up in a creative environment in which storytelling, collecting clay, gathering wild plants, and producing figurative pottery were part of his everyday life. "I have something very important to do before I go. I want to preserve my culture and inspire our youth to accomplish whatever it is they dream to be." His grandmother Laurencita Herrera and his mother, Seferina Ortiz, were both renowned Pueblo potters. "Having known Virgil Ortiz for over a decade, I have seen him grow into one of the most significant artists in New Mexico," said nominator Garth Clark, Editor-in-Chief of CFile Foundation and one of the most renowned authorities in the world on ceramic arts. "His ceramic sculptures and pottery have moved Native pottery forward and his other designs in clothing and furnishings show just how prolific he is at his art," Clark said. U.S. Rep. Ben Ray Lujan said Ortiz should be honored not only for his significant artistic contributions but for his dedication to youth and children. "When a special artist comes into our lives with a willingness to share their heart and soul, able to share a piece of themselves through the magic that flows through them, all while not forgetting to mentor others, we have the responsibility to recognize them for making New Mexico even more special than she already is. Virgil Ortiz is one of those artists," Lujan said. "From his pottery in a clay medium, to live canvasses that breathe inspiration, to fashion collaborations with Donna Karan, his art has moved people and inspired a new generation to tell the stories that have lived here for generations." 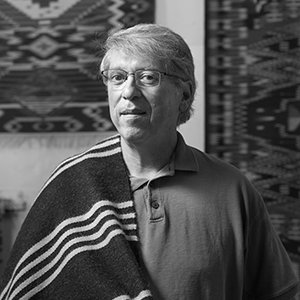 Irvin Trujillo: "Irvin Trujillo is a seventh generation master weaver who has taken Rio Grande weaving to new heights of mastery and innovation in a career spanning 50 years," said nominator Michael Pettit, a writer and chair of the Board of Trustees of the Museum of New Mexico Foundation. "Every weaving pays homage to a profound tradition in his family, community, culture, and state; at the same time they assure traditions will find new vitality going forward," Pettit said. Trujillo has mastered traditional dyeing and weaving methods, and then brought innovations to those techniques and tools. "All of which he has shared freely with his peers and the public," Pettit said. "No weaver in New Mexico—none in the Southwest—enjoys or deserves a higher reputation than Irvin Trujillo." The Denver museum has purchased two of Trujillo's weavings that will be featured in Creative Crossroads: The Art of Tapestry, which opened on May 28, 2015. Trujillo learned the art of weaving at age 10 from his father, master weaver Jacobo "Jake" Trujillo. In 1982, in partnership with his father and his wife, Lisa, Trujillo opened the Centinela Traditional Arts studio and shop. Trujillo was awarded a National Heritage Fellowship in 2007 for lifetime achievement in Folk and Traditional Arts from the National Endowment for the Arts (NEA), our nation's highest honor in the field. "Irvin has not only continued the weaving tradition in his family for seven generations, but he has reinvigorated Chimayó weaving by drawing upon his engineering and music experience to create large, richly colored and exquisitely intricate tapestry weavings," said Helen R. Lucero, the retired director of visual arts at the National Hispanic Cultural Center, who co-authored Chimayó Weaving: The Transformation of a Tradition. "In my opinion, Irvin is by far the best New Mexican Hispanic weaver of all time." Edgar Foster Daniels: Edgar Foster Daniels, 83, is an accomplished actor, singer, and major patron of the arts. "Edgar has dedicated his life to the arts," said nominator Charles MacKay, the general director of the Santa Fe Opera. "I can think of no one more deserving of the honor (Governor's Arts Award)." Daniels spent the first 30 years of his professional career acting on the Broadway stage, as well as in Hollywood films and on television. "Even before his retirement from acting in 1983, he began to focus his keen and boundless energies on supporting the arts from the other side of the stage," MacKay said. The first production Daniels underwrote at The Santa Fe Opera was Strauss's Daphne in 1981. He founded the Edgar Foster Daniels Foundation in Santa Fe in 1995. "Edgar was the first recipient of the Best Philanthropist/Sponsor Award at the inaugural International Opera Awards in 2014," said MacKay. Daniels has supported numerous other arts organizations in New Mexico, including Performance Santa Fe, the Santa Fe Chamber Music Festival and the Spanish Colonial Arts Society. A longtime resident of Santa Fe, Daniels is also an avid collector of New Mexican artwork and has supported the careers of many local visual artists. 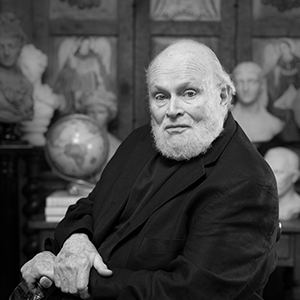 Daniels first visited Santa Fe in 1958 to attend the Santa Fe Opera company founded by John Crosby, a Columbia University classmate and childhood friend. In addition to his substantial giving, Daniels also has been unstinting in his service and currently serves as an honorary board member at The Santa Fe Opera. Eric Renner and Nancy Spencer: Eric Renner and Nancy Spencer have devoted some three decades to the historical art form of pinhole photography. They established Pinhole Resource, Inc. in 1984 to provide resources, advice and information for photographers around the world. In addition to a journal and Web site, they have authored many books that are used as resource texts by artists and students around the world. "Nancy and Eric's devotion to Pinhole art, their dedication to providing various rich resources to others interested in the topic, and their efforts to educate the public about the art form have helped to raise awareness of Pinhole photography in New Mexico while enriching artists, students and their New Mexico community for decades," said nominator Faye McCalmont, the long-time executive director of Mimbres Region Arts Council in Silver City, which received a Governor's Arts Award in 2013. Renner and Spencer donated their Pinhole collection of more than 6,000 photographs, cameras and books to the New Mexico History Museum in 2012. In April 2014, the History Museum opened "Poetics of Light: Pinhole Photography," which has been one of the museum's most popular exhibitions, with an extended run through January 10, 2016. "The New Mexico History Museum's presentation of 'Poetics of Light,' based on the Pinhole Resource Collection is an in-depth, eye-opening survey of contemporary pinhole photography, the largest exhibition of its kind ever assembled," said Daniel Kosharek, Photo Curator at the History Museum. 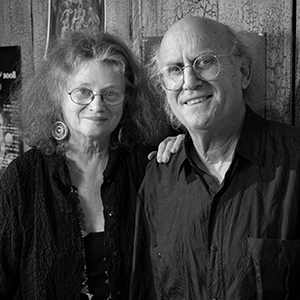 Mary Anne Redding, former chair of the Photography Department at the Santa Fe University of Art and Design said: "If any two individuals with a long history of influence on the photographic arts in New Mexico deserve the Governor's Award for Excellence in the Arts, it is Eric Renner and Nancy Spencer—for their vision, their passion, and their commitment to education in the arts."